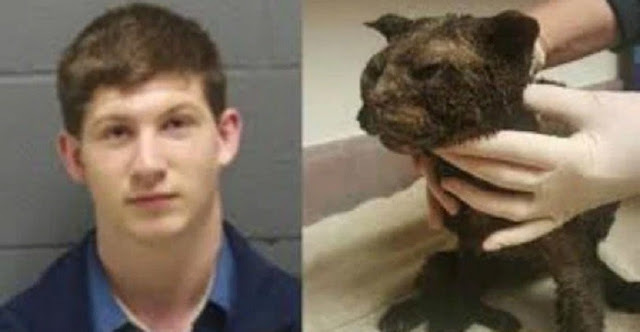 This is not a man, he is a beast who deserves to rot in a jail cell. His name is Noah Riley, he is 19 and lives in Montgomery County, Indiana. What did he do? He hogtied a cat, poured gasoline on her, and set her on fire. There was also a firecracker that had been tied to her head, but thankfully, it did not go off. 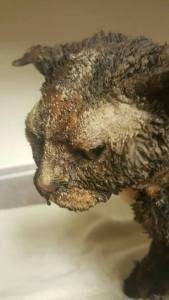 Steve Wright found the cat hear the Crawfordsville Municipal Airport. Riley surrendered himself to authorities. Currently, the cat is being cared for by the Animal Welfare League of Montgomery County. In relation to this case, a juvenile was also arrested. The cat’s fur is gone, her ears are shriveled. They believe the only reason she survived is that she landed in some mud that slowed down the flames. A kind person has already agreed to adopt the cat. If you want to help with her medical expenses, click here.